The R&A have recently announced significant changes to the Old Course at St Andrews, golf’s ‘first course’ and the shrine of our game, in moves that can only be interpreted as a bowing to technological advancements in the game. Proposed changes to nine of the holes will be implemented by course designer Martin Hawtree over two phases, to supposedly stiffen the Old Course’s defences in time for the 2015 Open Championship. R&A chief executive Peter Dawson said the changes are intended to make the elite players be more precise with their shots. “While some holes have been lengthened on the Old Course in recent years, it has otherwise remained largely unaltered,” Dawson said. The howls of outrage from around the world have been swift and vociferous since the news broke, from concerned players, course designers and the general public who have an interest in the traditions of the game. I spoke to Peter Thomson, winner of the 1955 Open Championship at St Andrews who has at home in the town, on Thursday from China and he repeated his disbelief at reading the news. “I think it’s preposterous. (As a ‘local’) I had no inkling of this at all, it was all very secretive. I think it will hit them hard over the next few months with a continual barrage of disapproval,” he said. Many would prefer the R&A took steps to change the laws on technology, as they and the USGA have just done by announcing changes to the ‘anchoring’ rule from 1 January 2016, than ‘tinker’ significantly with the playing characteristics and traditions at the Home of Golf. Thomson agrees, but adds ‘they don’t have a very good record’ – when it comes to issues like the length the golf ball flies, which has been debated for decades. 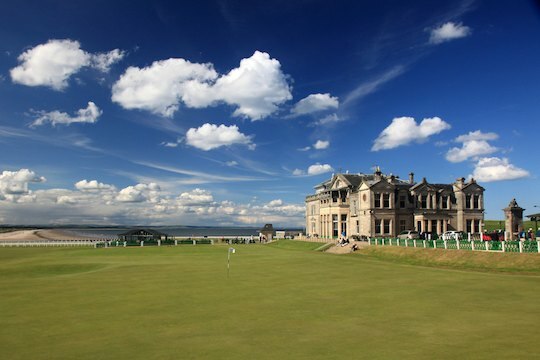 The Old Course holds a unique position in the fabric of our game as the ‘first’ golf course and the strategic blueprint for many. Should you make the pilgrimage to St Andrews, you do so in the knowledge that you’re taking on the same course with its quirky bumps and hollows as all golfers have done for centuries. Tinkering with such sacred ground is like suggesting changes to the Mona Lisa; or perhaps lengthening the cricket pitch because players today are faster, fitter and stronger than their forebears. There have been changes to the course over the years with the addition of new tees, adjustments to bunkers like the Road Hole and Hell Bunker, which bears little resemblance to the Hell Bunker of the early 20th century, but the general contours and playing conditions of the holes have remained virtually the same. Should these phased changes be introduced however, most of the changes suggest a ‘re-contouring’ of greens, raising or lowering levels of the putting surfaces and adding and removing bunkers, which are the most significant changes for the best part of a 80 years. Noted course designer Tom Doak has written letters to golf course architects associations around the world seeking their support to petition the Links Committee to halt the changes. As custodians of the Old Course for centuries, the R&A and Links Committee can hardly have come under more criticism for a decision than these announcements have aroused. Whether they listen to the clear messages they’re getting will be of critical interest to many. Growing The Game: Where has golf gone wrong?